How much of the hostility that plagues the world results from “irreconcilable differences” or at least real differences and how much results from mistakes that destroy good relationships? 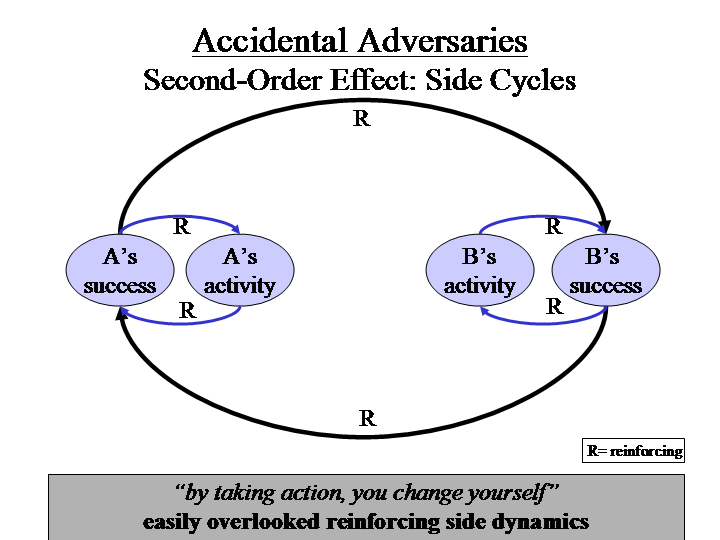 The “accidental adversaries” archetype guides us to think about the mistakes. 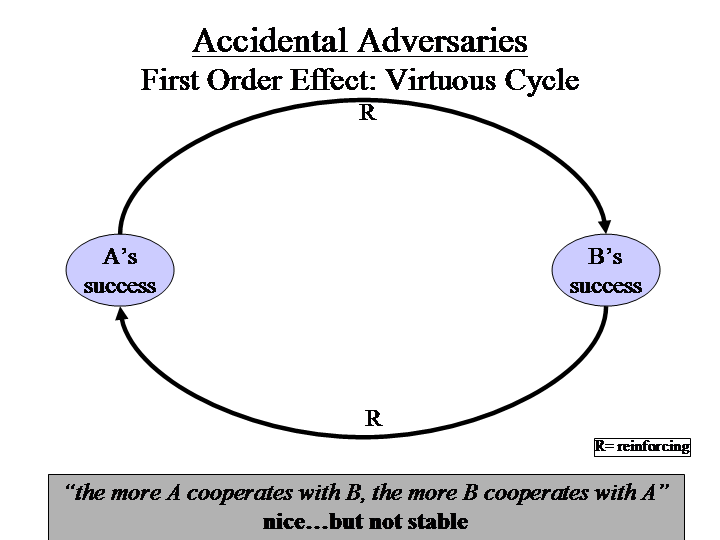 The original dynamic is a virtuous cycle in which A’s success reinforces B’s success, which further reinforces A’s success. This appears wonderful but contains the seeds of instability that will sprout with the second-order effects. The second-order effects may well occur only after a time delay and constitute internal changes within each side. This latter characteristic in itself inhibits recognition since people have a tendency to deny that their behavior alters themselves; in effect, we see ourselves as immutable even as we see others as changing (“you are no longer trustworthy”); on other occasions, we may insist that both sides are immutable (“we are good; they are evil”). Denial about the impact of one’s own behavior on oneself blocks understanding of dynamics throughout interpersonal and political relationships. In addition, second-order effects are subtle since they occur within each side (i.e., have no direct and immediate impact on the other side) and are also reinforcing, so not only may they be hard to see, even if seen, no one is likely to care because they do not appear to cause any harm. Unfortunately for those trying to forecast the future, one can have too much of a good thing. An example from world affairs would be the building of empire by A, with the support of client state B. As the imperial project attains increasing success, A becomes infected with hubris (A’s activity), leading A to step on its client’s toes. The undermining dynamic that then arises is that B now begins to see its client status as harmful rather than a security success. 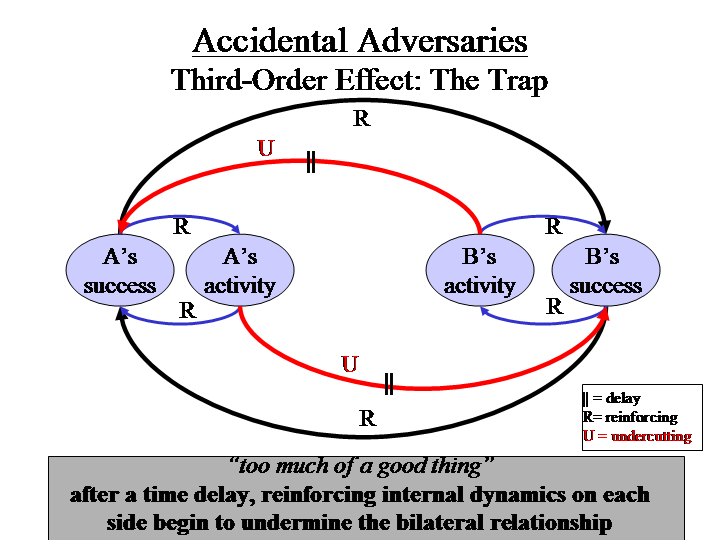 Similarly, as B gains increasing security from its protected client status within the empire, it gradually gains both power and confidence, leading it to desire independence, which A interprets as a threat to the empire even though B may well see itself as asserting independence to protect the empire – as an ally rather than a client! A’s misperception, its eyes clouded by hubris, provokes an accident.